CHANDIGARH, March 31 : Four students of Theatre Age have passed their 8th class exam this is a big achievement for the children of theatre age.Theatre Age is an NGO aimed at providing a platform to underprivileged and exploited slum children for channelising their youthful energy into constructive avenues, with a vision of transforming them into enlightened and economically independent citizens. Theatre Age utilises the charm of various performing arts like Drama, Dance, and Music to attract slum children into its fold. 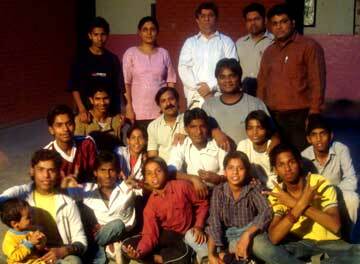 Regular free classes are conducted by voluntary professionals to train children in these arts. At least one healthy meal is served daily to retain their interest. These children are provided with suitable clothes, shoes, books etc. Once a child gets stabilised, he is introduced to formal education and the promising ones are admitted to government schools. After investing years of efforts in grooming a child, at an appropriate stage, he is helped to find a suitable vocation â€“ thus completing his journey from a street urchin to a responsible, respectable, economically independent citizen. Theatre Age is a self supported NGO. Its members collect old newspapers and other sundry discarded items from its well-wishers. These are then sold off to raise funds. Besides, its members also make and sell paper envelopes, wax candles, greeting cards etc. Some income is also generated by performing Theatre/Musical shows by children. The Society also gets frequent donations from spirited citizens/institutions impressed by its work.